BENGALURU, India / CES Las Vegas, NV – January 6, 2017 – Corsair®, a world leader in enthusiast memory, high-performance gaming hardware and PC components today announced the immediate availability of the new CORSAIR HX series and CORSAIR TX-M series of enthusiast power supplies. Equipped with 100% Japanese 105°C capacitors the new HX series offers 80 Plus Platinum efficiency for up to 94% efficient operation. Fully modular cablingmakes clutter-free builds easy, while a large 135mm cooling fan and Zero RPM mode allow for virtually silent operation.Rated for operating temperatures up to 50°C, the HX series is designed to deliver superb electrical performance and efficiency in the most demanding situations. Also furnished with 100% Japanese capacitors and rated to 50°C, the new TX-M series delivers 80 Plus Gold efficiencypaired with fantastic electrical performance and reliability. Combined with semi-modular cables for immaculate builds, the TX-M series hits the sweetspot of features and performance that PC enthusiasts demand. The CORSAIR HX Series of PSUsare available immediately from the CORSAIR worldwide network of authorized retailers and distributors, and are backed by a comprehensive 10-year warranty. 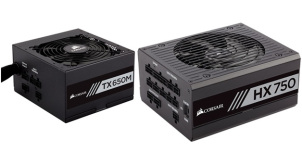 The CORSAIR TX-M Series of PSUsare also available immediately from the CORSAIR worldwide network of authorized retailers and distributors, and are backed by a comprehensive seven-year warranty. For up-to-date pricing on the new HX Series and TX-M Series please refer to the CORSAIR website or contact your local CORSAIR sales or PR representative.